Sometimes doing the job is reward in itself. 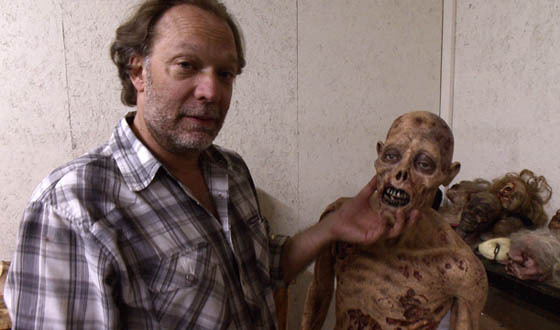 That’s what it was like for me to talk with Greg Nicotero. From DAWN OF THE DEAD to BREAKING BAD, from ARMY OF DARKNESS to OZ THE GREAT AND POWERFUL, from HOSTEL to SIN CITY: A DAME TO KILL FOR, his vivid and creative makeup effects work has brought the fantastic, the grotesque, and the sometimes-just-plain-realistic to a dazzling kaleidoscope of film and TV projects. That includes THE WALKING DEAD, the blockbuster TV series which scooped up a couple of primetime Emmy awards for Nicotero’s work in bringing the flesh-hungry walkers to gruesome… uh, life? Death? Anyway, in honor of the release of the complete fourth season on DVD and Blu-ray this Tuesday, we got some time with Greg to talk about the finer points of zombie nurturing and care.